The 2011-12 regular season had some highlights for the New Jersey Devils -- Ilya Kovalchuk settled in and rebounded after a disappointing start to his tenure with the team, Adam Henrique became a Calder Trophy candidate, David Clarkson reached 30 goals -- but the campaign obviously will be remembered for what happened in the Stanley Cup Playoffs. New Jersey finished fourth in the Atlantic Division but rolled past two archrivals -- the Philadelphia Flyers and New York Rangers -- to reach the Stanley Cup Final for the fifth time in 17 years. Though defeating the Rangers to reach the Final was cathartic for some longtime Devils fans, a fourth championship did not follow. New Jersey became the last of four teams to be steamrolled by the Los Angeles Kings en route to their improbable title. It was a great year for the Devils, but the offseason brought tense times. Nearly everyone, including franchise icon Martin Brodeur, was retained, but the most important free agent, captain Zach Parise, left for the Minnesota Wild and a 13-year, $98 million contract. General manager Lou Lamoriello said there is no replacing a player like Parise, and the Devils have a major hole in their lineup. 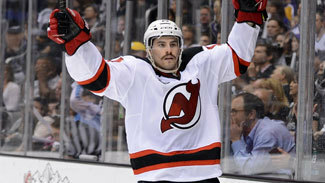 Under-valued: Adam Henrique - Rookie came out of nowhere last season to finish with 16 goals and 51 points. He won't get you any PIMs, but point production should only increase after proving his value in playoffs (13 points, plus-12 in 24 contests). Over-valued: David Clarkson - Broke out last season with 30 goals and 138 PIMs, but never scored more than 17 goals in any of his previous four NHL seasons. Expect a regression. Sleeper: Travis Zajac - Appeared in just 15 regular season games last season due to injury, but came alive in playoffs with 14 points in 24 games. Look for him to center one of New Jersey's top two lines. NOTES: Petr Sykora, who went from camp tryout to 21 goals last season, is an unrestricted free agent and might make sense as a late addition to help an offense short on goal-scoring wings. Expecting Clarkson to reach 30 again could be a stretch, but steps forward from Henrique and Josefson could help replace some of the missing offense. Tedenby proving he belongs in the NHL would help. A full year from Zajac also won't hurt. Bernier, Gionta and Carter were great together as a fourth line, but the Devils at this point are at least one top-nine forward shy of being able to keep that group together -- unless they become the new third line. The development of Larsson might be the key to the entire season for the Devils. If he can be a top young defenseman in his second season, it would help New Jersey at both ends. While trying to keep the band together, the Devils put off looking for a long-term replacement in goal for Brodeur for at least another season. He and Hedberg both are back on two-year deals.